This salad is a peachy southern twist to an Italian caprese salad that substitutes ripe, sweet Georgia peaches for the traditional tomatoes found in caprese salads. The local peaches this year have been exceptionally sweet and delicious. This time of the year most of our peaches come from Georgia and South Carolina. Picking out peaches can be tricky though. Normally when you see them they haven’t quite ripped yet and can be hard. Don’t worry, just bring them home and store them on the counter for a few days and they will ripen before you know it. I say “before you know it” because peaches can get away from you. One day they are still hard and the next day they will be perfect. If you don’t catch them at just their peak of ripeness, they shrivel and should be thrown away. Of course you know this, but always avoid buying any kind of fruit that is bruised. I also pick up a peach and smell it before I buy it. When you take a whiff, if you don’t detect a faint peach smell, keep looking until you find one that actually smells like a peach. The vinaigrette for this salad contains honey to bring out the sweetness of the peaches. A little tip about measuring honey – if you use the oil first in your spoon, followed by the honey, the honey won’t stick to your spoon. The combination of the mint and basil in this salad just brings all of the flavors together beautifully. We served it with my father’s southern “unfried” chicken for lunch and it was a big success. I hope you enjoy it as much as we did. Prepare the vinaigrette by combing the ingredients in a glass jar with a screw top lid. Shake well to combine and set aside. Cut cheese into 1-inch pieces (or leave whole if they are small balls) and gently toss with the peaches. Add the vinaigrette and toss again gently. Add a little freshly ground black pepper and the basil and mint pieces. Serve right away. These are two other peach recipes that I’ve made in the past that I think you’ll enjoy during peach season. 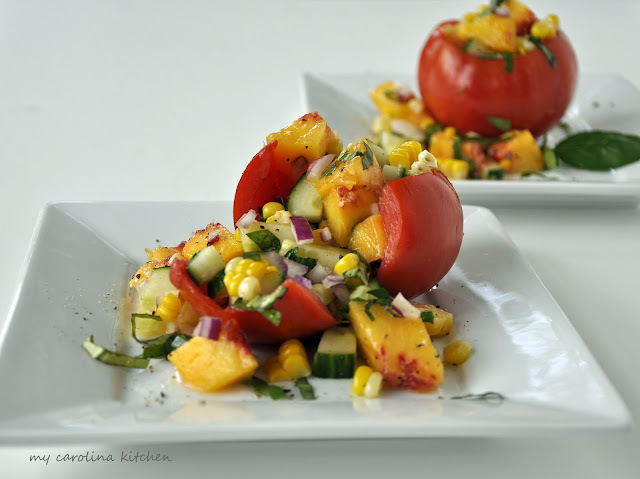 Stuffed tomatoes recipe - this stuffing is fabulous with the crunch of the cucumber and red onion mixed with the corn, peaches and basil. I almost ate it before I stuffed the tomatoes. The silkiness of the peaches and prosciutto goes well with the salty prosciutto in this green salad in this recipe. For those of you celebrating the 4th of July next week, I hope you and your family have a safe and happy holiday. This guy was in our driveway the other morning enjoying a few tender shoots for breakfast. As you can see, he wasn’t the least bit afraid of us. Trouble is, sometimes his breakfast of tender shoots includes the leaves of our azalea bushes! Having lived from coast to coast and in between, I can say that there is no peach like a Georgia peach! Our peaches now come from Michigan (although there are occasional opportunities for Georgia peaches) and are quite good. The early spring frosts have damaged the MIchigan crop and peaches will be scarce. I can't wait to try your lovely salad no matter what the lineage of the peaches I can obtain. I can't wait for peach season. 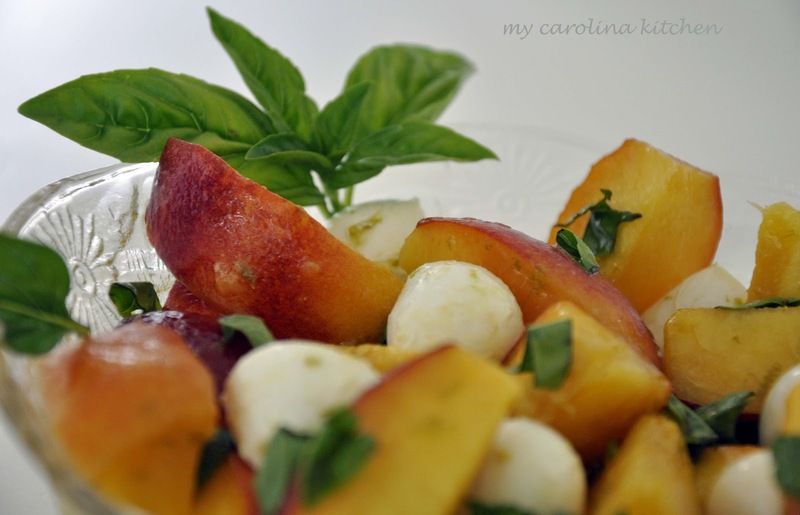 What a great idea to substitute peaches for tomatoes in a caprese salad. The other recipes looks so delicious as well. Can't wait to try them. Once again your photos are amazing. I'm getting a new camera and I hope my photos get better. Absolutely scrumptious! A refined and refreshing sald. Love your stories and recipes. I am from Asheville, NC and live in the Fort Myers area, so I feel we have a bond. Perfect timing, Whole Foods has peaches as their special Friday deal tomorrow! Peaches are definitely in season, and you salad is just beautiful! 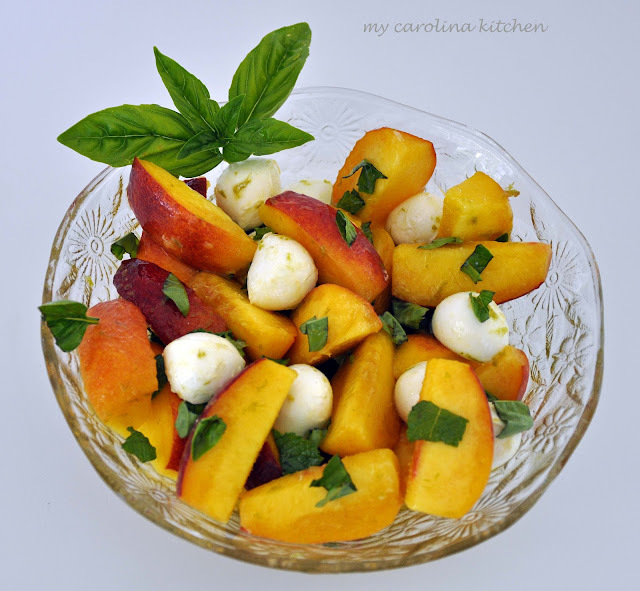 Oh, this looks so delicious, I can't wait to find ripe peaches and make this special Caprese salad! I have been on a lime with a little honey vinaigrette trip for several weeks now. Your salad recipe will fit right in. You're right, a great twist on a caprese salad, and, although it's not a Georgia peach, peaches are ripening here, too, and the home grown ones should be ready in a few weeks. I'll be trying this! This is quite a twist! Turned out beautiful though. Love the photos...fun to watch the deer from your window, but they do seem to eat every blossom in sight! sounds perfect for the summer! yum! I find unripe is less a problem than seemingly ripe and then mealy on the inside. That really bugs me! Do you have a solution for that? P.S. This is a perfect summer salad. peaches, peaches peaches! 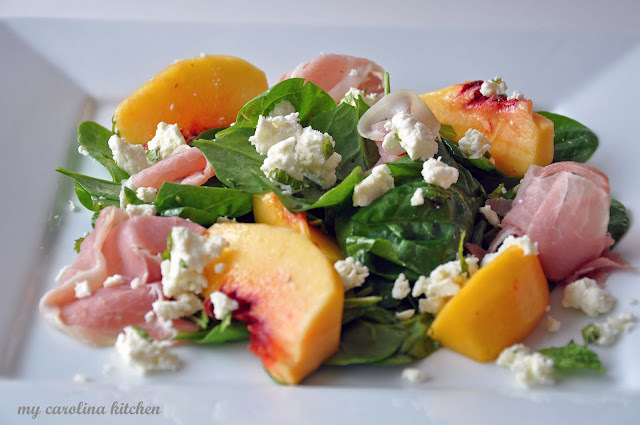 I love peaches and i love this summer salad! Beautiful! I have been on a peach journey lately...peaches are amazing when they are perfectly ripe. You are right, one day they can be hard and the next perfect. This is a beautiful twist on an Italian classic. P.S. I am planning to get my hands on more fresh peaches. A creative and delicious twist on a classic Italian salad. Need to get some more stone fruit today! Lovely salad recipes..Timely post with summer on our doorstep:)Thank you Sam. This looks like a summer treat! I have been thinking about peaches recently - I've used them in a pie, but never in a salad. It's about time, and this looks like a wonderful option for my July 4th dinner! I love your fresh summer salad. Please share it on my foodie friday party today. I hope you and Meakin have a wonderful holiday. This salad sounds so delicious, Sam. You certainly have given the caprese salad a whole new look (and taste). Our peaches are ripe around the end of July depending on the weather and I can't wait to try this recipe. Thanks for sharing. Ripe peaches is what I look forward to every summer. This looks so refreshing and is a gorgeous dish to serve for summer picnics. Thanks for the tip on the keeping honey off of the spoon, very helpful. Very fresh and delicious ..fit for summer! You caught the deer just right and according to my cousins the deer keep their azaleas eaten to the ground - with all of ours and lots of deer, I guess we've just been lucky. You are definitely the master of using fruits in salads and thanks to you I now enjoy them as I'm sure I will this one. We haven't gotten any great peaches as yet. I'm sure yours are so sweet and juicy. Lovely salad. Great idea for a salad, Sam. 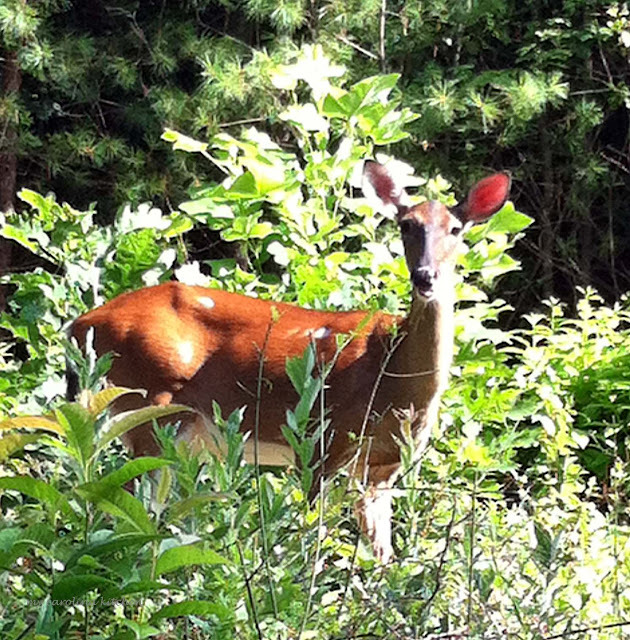 That's a great deer shot but I know what you mean with your bushes. One came into my perennial bed recently and crushed all the plants as he layed there snoozing. Your salad sounds and looks delicious. I will be trying it whenever we have good peaches at the farmers market! Thanks for the recipe! I love the "oil then honey" tip. Absolutely beautiful photos Sam and this salad looks wonderful. A must make! 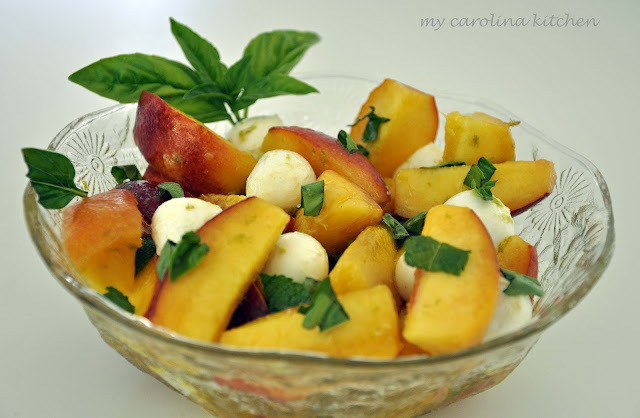 I really love this peach Caprese salad! This looks refreshing, flavorful and healthy. I also love the stuffed tomatoes. I've got to pin these for those nice summer afternoons, when we want a lite salad. Hi Sam, I really like the "southern twist" on this classic Italian salad! The other 2 recipes look just as delicious too! I'll keep them on my summah (we're in Maine) menu for certain! I just bought a whole bunch of fresh peaches from the Farmer's Market in Memphis, TN. I think they would count as Southern, right? You are correct that they ripen super fast once in the house. I made a Peach-Almond Crisp but now I want to get some more this weekend just so I can make your yummy-looking Caprese salad. Very clever recipe! Peaches and creamy things go so well together. And thanks for the peach buying tips. I often shy away from buying them because I don't know how to pick out winners! What a beautiful and refreshing salad! I love it! Oh yum! I love the use of peaches in your salad. It looks so summery and refreshing! I'm looking forward to peach season here. I have never added mozzarella to peaches...how interesting..certainly a new twist! thanks you!! and it looks beautiful. What an interesting combination. I will have to try it. In Istanbul right now, peaches are at their peak. I've been eating Bursa peaches with thick Turkish yogurt and honey everyday. I will have to try this though because it is so unexpected. Thank you, Sam. 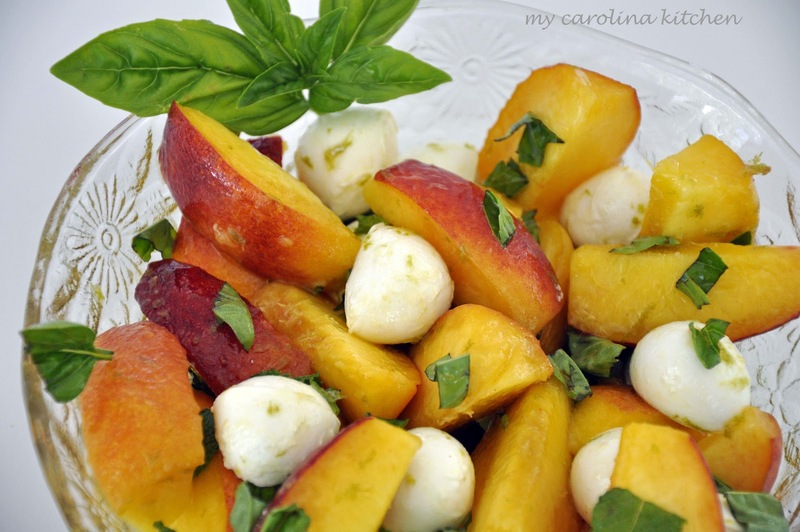 We've gotten some delicious peaches lately -- I'll have to try the Caprese recipe! The only other peaches that I have eaten that tasted as good as a Georgia peach were from Washington. I love this variation on a caprese salad and all of the delicious ingredients in it. Love the corn too! I just made this for lunch, Sam. I used white balsamic and had to skip the mint (hubs doesn't like it). Loved it! Thanks for inspiring me to try this recipe. This was a wonderful salad, and the big hit of my July 4th dinner. No leftovers! Thanks for the inspiration, Sam! Congrats, your salad is being featured on Foodie Friday today. Stop by and pick up a featured button and have a lovely weekend. What a nice change! Peaches are my favorite summer fruit. "Trouble is, sometimes his breakfast of tender shoots includes the leaves of our azalea bushes!" Sam, I saw and commented on this lovely peach salad over on Facebook, but after reading your granita recipe, I scrolled down and had to comment again here. Lovely, lovely, lovely and it has to be so delicious with the fresh peaches that are available right now. This is a nice twist on the traditional Caprese salad. I wish I could jump through the screen and enjoy this. I'm new to South Texas so I haven't found my cheese place yet. Cheese is a must in my house and this salad is just calling my name.